Though rootkits have a fairly negative image, they can be used for both good and evil. Designing BSD Rootkits arms you with the knowledge you need to write offensive rootkits, to defend against malicious ones, and to explore the FreeBSD kernel and operating system in the process. 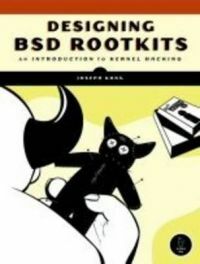 Organized as a tutorial, Designing BSD Rootkits will teach you the fundamentals of programming and developing rootkits under the FreeBSD operating system. Author Joseph Kong's goal is to make you smarter, not to teach you how to write exploits or launch attacks. You'll learn how to maintain root access long after gaining access to a computer and how to hack FreeBSD. Kongs liberal use of examples assumes no prior kernel-hacking experience but doesn't water down the information. All code is thoroughly described and analyzed, and each chapter contains at least one real-world application. Included: The fundamentals of FreeBSD kernel module programming Using call hooking to subvert the FreeBSD kernel Directly manipulating the objects the kernel depends upon for its internal record-keeping Patching kernel code resident in main memory; in other words, altering the kernel's logic while it's still running How to defend against the attacks described Hack the FreeBSD kernel for yourself! Tinkering with computers has always been a primary passion of author Joseph Kong. He is a self-taught programmer who dabbles in information security, operating system theory, reverse engineering, and vulnerability assessment. He has written for Phrack Magazine and was a system administrator for the City of Toronto.